Baked Ham Dinner. A full comfort food menu including a cobbler dessert! A perfect baked ham dinner featuring recipes for the easiest glazed ham, with 2 delicious side dishes & a comfort food dessert too. Sunday dinner covered! Gather the family, invite a few friends if you want and serve up one of the best comfort food meals you can ever enjoy, an incredible baked ham dinner. We are ham junkies at our house and with a couple of delicious side dishes you too can easily make one of the easiest and best comfort food meals to please almost anyone around your table. Click the photos or titles below to get the recipes. Dijon Mustard and Brown Sugar Glazed Ham, the centrepiece of this great Baked Ham dinner! 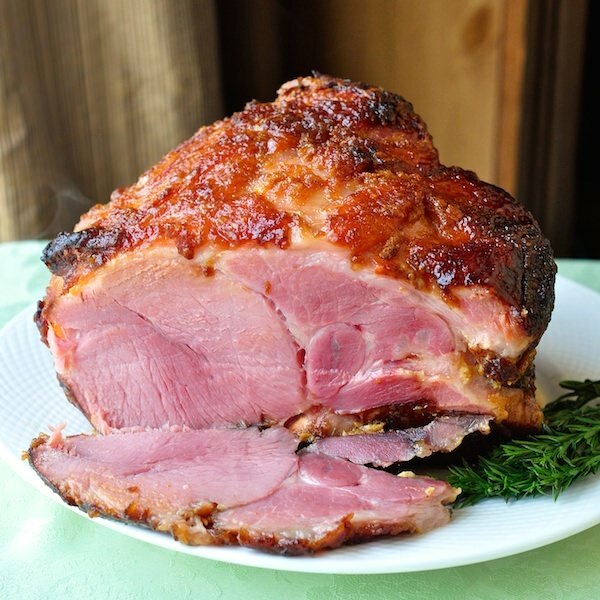 Our Baked Ham Dinner menu starts with the best baked glazed ham recipe that I have ever tried. Our family has been enjoying this incredibly easy ham recipe for so long it’s hard to remember when we first started making it. This is what I call a recipe for life and although I love new and different food preparations of all descriptions I can honestly say that if I never had another baked ham until I die, I would be perfectly happy with that. The way the sweet brown sugar caramelizes with the natural fat and pungent Dijon mustard is just perfect. I could stand in the kitchen and pluck all the caramelized glaze off with my fingers and devour it before it ever gets to the table. It is that good! Scalloped potatoes are a natural combination with baked ham. 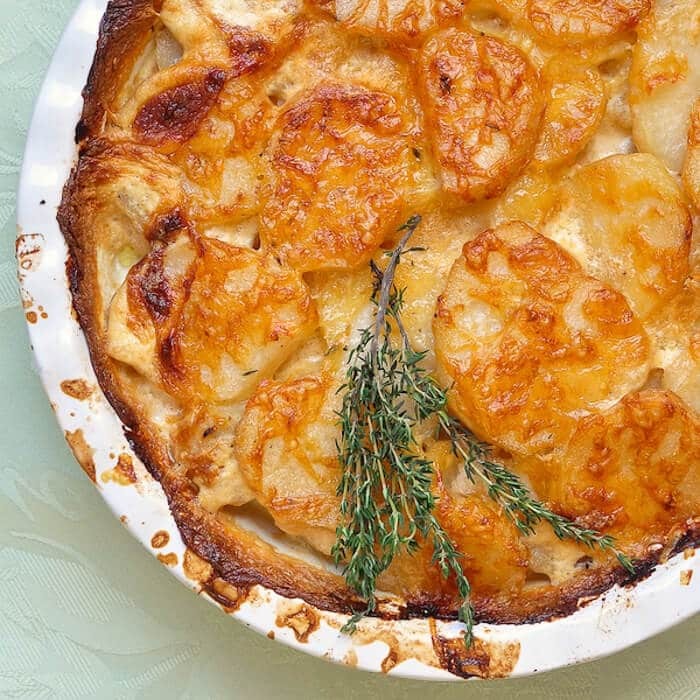 Although some may be intimidated by the posh French name associated with this recipe, it is indeed just a great scalloped potato recipe. Pronounced “dough-fin-waz” this is a terrific basic recipe incorporating the French technique of par boiling the potatoes in the cream and milk that will form the final sauce. The potato starch also helps to thicken the rich sauce in which the sliced potatoes are baked. This particular recipe uses thyme and shallots as the flavour base for these incredible potatoes but you can easily adapt the recipe to your taste by using garlic or onions along with your favourite complimentary herbs to create your own favourite version. Let your own taste and inspiration be your guide. A little Dijon mustard added to the milk and cream is also delicious in this recipe and compliments the ham very well. You only think you don’t like brussel sprouts. As with so many other green vegetables, like asparagus and broccoli, overcooking is generally what brings out the bitterness in these vegetables and makes them unpalatable to many folks. I just can’t stand them when they are overcooked. As a general rule, if these sorts of vegetables lose their intense green colour and start to turn to dark green, then I refuse to eat them. It is a sure sign that they have been overcooked to practically inedible. I particularly like this recipe because I can pre-cook the brussel sprouts ahead of time, immediately immerse them in ice water to stop the cooking action and preserve their colour. 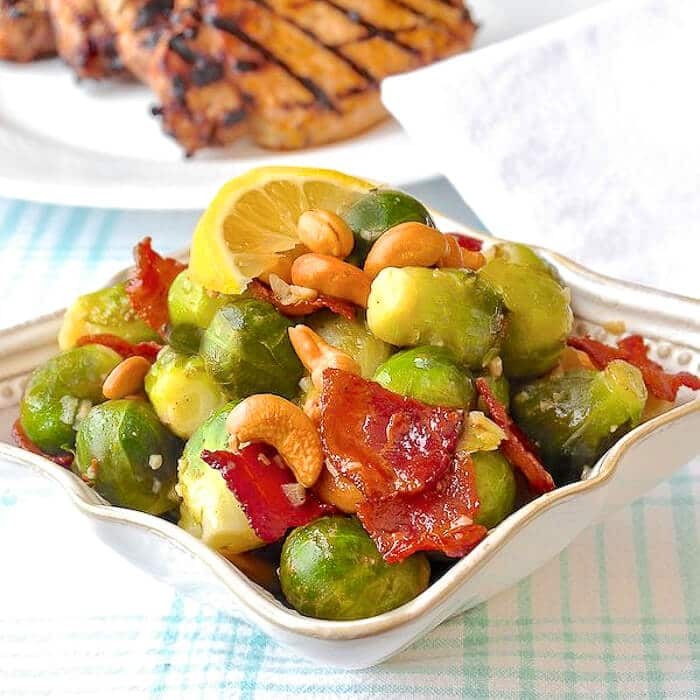 I then toss them in the garlic butter, bacon and cashews to finish them off immediately before serving. A delicious homemade comfort food dessert is an absolute must after such a wonderful meal and I can’t think of a better one than a simple fruit cobbler. I’ve used frozen cherries to create this easy, simple warm baked dessert that goes so deliciously well with a scoop of good quality vanilla ice cream, whipped cream or thick dairy cream. The ideal end to a a home cooked meal that will remind everyone at the table that a taste of home can rival any eat-out meal. Slow down and enjoy good food, family and friends, after all, Monday is right around the corner…but don’t despair, just start planning another incredible Sunday comfort food meal. Like this Baked Ham Dinner? Served your baked ham recipe for Easter Sunday dinner yesterday & everyone loved it! I followed your recipe to the tee, but I found that when I rubbed the ham with the Dijon grainy) mustard it went kind of runny over the meat. Also, the sugar wouldn’t stick to the mustard as it too melted . Am I missing something? Maybe let the ham steam off for a while after boiling and pat it dry with paper towels. You can also keep reglazing it. Cooked this full meal today! Without a doubts the best I ever tasted . The potatoes were exceptional . This will be my go to ham dinner from now on . So easy to prepare but so so delicious! I love Rock recipes ! Cooked this ham for dinner this evening, everyone loved it even the grandkids, this will definitely be my go to recipe for ham from now on, delicious.